The Life Fitness Platinum Club Series FlexStrider Trainer is ON SALE! The Life Fitness Platinum Club Series FlexStrider is a variable stride trainer that lets you adjust your stride length easily mid-way through your workout. Imagine switching instantly from a slow easy jog to a large ground covering run. It is possible with this unique machine. The Platinum Club Series FlexStrider has been designed with ergonomics in mind to give you a very natural and authentic ‘running’ experience. The FlexStrider also has a FitPower Display, over-sized pedals and heart rate monitoring. As with all of Life Fitness’s machines, the quality construction and superior feel will justify the price. It is up to you to decide if you can afford the $9,000 price tag for a piece of workout equipment. 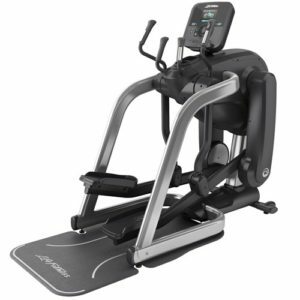 Life Fitness Platinum Club Series FlexStrider Sale! The Life Fitness Platinum Club Series FlexStrider typically sells for $9,999. The FlexStrider includes programs for manual goals, random hill, hills and rolling hills. It also has front wheels for easier mobility if you need to move the machine around. The FitPower Display combines your speed, resistance, and stride length to calculate a total energy output of the user. This machine lets you instantly switch stride length from 0-36″ with the press of a button. The pedals are located close together to minimize hip discomfort. This is a really cool machine to use. It really does feel more like you’re running than any other machine we’ve tried. We like the ability to switch from 0-36″ stride length. The FitPower Display helps the user figure out if they are really pushing the limits with their chosen settings. It’s a useful feature. We liked that the resistance controls are located within easy reach on the moving handlebars. There are three console options with this machine. The Discover SE3 has a 16″ touchscreen with Android/Apple compatibility, TV, Internet, Bluetooth, Interactive courses, Integrated Apps, 42 Workouts, 8 Custom Workouts, and limitless user profiles. The Discover SI has a 10″ touchscreen without the TV. The Explore console has a 7″ non-touchscreen without workouts or user profiles. This machine has it all: Integrated reading rack, Smartphone accessory tray, Wireless Internet, Heart Rate monitoring, Floor Mat… etc…etc… There is nothing to miss here. The machine is 564 lbs so it is STURDY. It does have wheels but we suggest you don’t plan to move it often. Let’s be real for a second. This is an AWESOME machine, but it costs $9,000. That’s as much as some would pay for a car. It’s got a ton of great features and comes from a great company. So if you’re got the cash – there’s really nothing bad we can say about this machine.